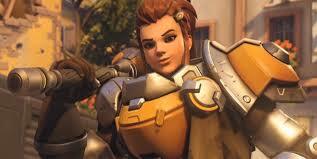 Brigitte (Br-e- gett-e) or as I call her Bridget, because I just can’t pronounce her name, will be the 27th hero in the Overwatch roster. She will be the 6 th new hero added to the game since its initial release on May 24 th , 2016 and the 3 rd newest support after Moira and Ana. complaining, she’s a beauty). 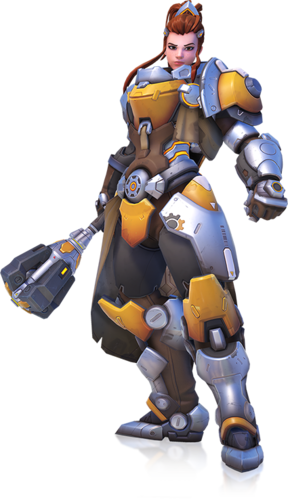 I feel the inspiration she takes from her 2 male role models (Torbjorn and Reinhardt) is reflected in the abilities she brings to the game. I even made a list of said abilities…. Rocket Flail – Her primary weapon, it offers a ranged attack, this will be good to knock the crap out of flanking Tracers and Genjis. Praise the Lord. It does 35 damage with 2 swings per second, although it cannot headshot. Repair Pack – This can heal an ally with 150 health per pack, but if ally reaches full health without using the 150 health on offer, any extra healing is used to add armour. Whip Shot – Basically she throws her Flail as a projectile and can do 70 damage, it also knocks back enemies so should be fun to play on Ilios. Barrier Shield – Like Reinhardt’s shield but smaller. It can take up to 600 damage. Bearing in mind she already has 250 total health (200 health and 50 armour), she is going to be one hell of an annoying support to kill. Shield Bash – When her Barrier Shield is deployed, Brigitte can dash forward to stun an enemy. I would recommend doing this to Tracer then caving her head in with your flail by the way. Inspire – A passive ability, whenever Brigitte strikes an enemy with her flail, it heals allies within a 20m radius. Rally – Her ultimate ability, she can move and provides allies in an 8m radius a maximum of 150 armour, which will last until removed by damage. Personally, I cannot wait to play her, because she looks fun to play and not just practical (like Mercy). I am loving the idea of a Tank/Support hybrid, as a Tank main myself it will be nice to have another Tank (like) hero to play where I can heal myself when supports are being unreliable.